The payload fairing of Japan's new H-2B rocket separates from the new HTV cargo ship in this artist's interpretation. Japan's new space freighter won't make the jump to light speed like the MillenniumFalcon, but it could pave the way for future human spaceflight endeavors. The H-2Transfer Vehicle (HTV), as it?s called, is scheduled to make its launchdebut Thursday atop an equally brand new H-2B rocket. The Japan AerospaceExploration Agency (JAXA) hopes that a successful debut for both vehicles willestablish the technologies for more ambitious missions beyond Earth orbit. "From the JAXA perspective this is a test flight," saidMasazumi Miyake, the deputy manager of JAXA's Houston office. "But we willbring several payloads to support ISS [International Space Station] logisticsand crew." A successfullaunch from Japan's Tanegashima Space Center Thursday at 1:01 p.m. EDT(1701 GMT) would allow HTV-1 to deliver 3.5 tons of needed supplies to thespace station. 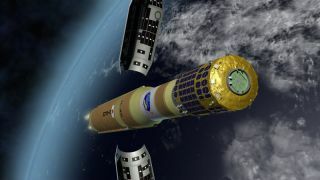 The cylindrical Japanese space freighter would then join Europe'sAutomated Transfer Vehicles and the Russian Progress spacecraft in resupplyingISS after the space shuttle fleet retires in 2010. But first, everything from launch to docking must go smoothly with whatis still an untested spacecraft on an untried rocket. Astronauts will also haveto perform the first-ever free-flyer capture of a spacecraft from the spacestation to pluck the HTV from space. Japan'snew H-2B rocket is a step up in size from the country?s earlier H-2Arocket, but can carry more than double the payload to orbit. That means JAXAcan move from launching satellites to full-fledged unmanned or possibly mannedspacecraft. Miyake said that H-2B shares many of the same reliable components withH-2A, and so JAXA has confidence in this rocket's maiden flight. "The launch vehicle is on its first flight, but most components andsubsystems are the same as H-2A launch vehicle," Miyake told SPACE.com. "The difference is that we have four [solid rocket] boosters rather than thetwo on H-2A, and two main engine thrusters rather than the one on H-2A." H-2A has just one failure compared to 14 successful launches on record,and has previously lofted hardware such as Japan's moon orbiter Kaguya. The largerH-2B rocket also requires about 1.7 times more propellant than its smallerpredecessor. It stands about 187 feet (57 meters). The extra carrying capacity allows H-2B to lift almost eight tons to ageostationary transfer orbit. The ?16 1/2-ton HTV-1, meanwhile, is destined fora lower orbit to reach the space station, which flies 220 miles (354 km) aboveEarth. Just as Japan's new rocket relies upon prior systems, the $220-millionHTV-1 also draws upon existing technology from Japan's massive Kibo laboratoryon the space station. Kibo is a giant facility the size of a tour bus that houses experimentsin a pressurized interior pod, an attic-like storage room and an externalscience platform. It has its own robotic arm, two windows and a small airlock. The HTV-1 is 33 feet (10 meters) long, 14 feet (4.4 meters) wide andcovered in solar panels to power its onboard systems. It can haul up to sixtons of cargo for use both inside the space station and outside, and will betoting both types of supplies when it lifts off on Thursday. "It?s the first unmanned vehicle that brings with it bothpressurized and unpressurized cargo," NASA space station flight directorDana Weigel said in a recent briefing. "It's also the first unmanned vehiclegoing to the U.S. segment, and the first free-flyer capture from ISS." A free-flyer capture means that space station astronauts must use a Canadianrobotic arm to grab the free-floating HTV-1. The space freighter does not automatically dock like the European andRussian spacecraft. Instead, a preprogrammed computer controls HTV-1's approachup until the moment of robotic grapple. The robotic arm operator, NASAastronaut Nicole Stott, must then seal the deal within a 99-second captureclock. "The rendezvous is mostly automatic as HTV is approachingISS," Miyake said. "At the last minute, the onboard crew has thecapability to abort HTV if something happens to the automatic system." Miyake added that Japanese engineers previously tested such dockingtechnology with satellites. No concrete plans exist yet for a Japanese manned space program, even ifJapanese astronauts have already flown to the space station and tested odor-freeunderwear in microgravity. But HTV-1 could provide some of the coretechnologies for Japanese astronauts to take their own rides into space. "Currently HTV will be disposed of in the atmosphere," Miyakesaid. "But if we could add some return capability to HTV, it could be oneof the technologies for manned spaceflight." Such a development could parallel European proposals to refit their ATVcargo ship for properreentry, rather than simply burning up in the atmosphere. Miyake noted thatupgrading the HTV design represents a real possibility for the future. "We hope that this HTV technology will contribute to future moonand Mars missions, and to international cooperation," Miyake said. The Japanese space freighter may soon fulfill the internationalcollaboration part of those wishes, as long as the mission goes as planned.Robert Lightfoot, deputy director of NASA's Marshall Space Flight Center,enthusiastically described HTV's role in that sense during a public meeting inJuly of a White House-appointed panel reviewing NASA?s human spaceflight plans. "I sat in the HTV review last week for the Japanese transfervehicle and that is one of the neatest reviews I have ever been in because youhad the Canadian Space Agency, you had JAXA, and you had the U.S. side talkingabout how we are going to actually capture this free-flyer HTV and we are goingto use the Canadian arm and go grab it," Lightfoot said. SPACE.com will provide complete coverage of Japan?s HTV testas well as NASA?s ongoing Discovery shuttle mission to the International SpaceStation. Click here forSPACE.com?s space station coverage and a link to NASA TV, which will broadcastthe launch Thursday beginning at 12:45 p.m. EDT.